In Every Step a Lotus, Dorothy Ko embarks on a fascinating exploration of the practice of footbinding in China, explaining its origins, purpose, and spread before the nineteenth century. She uses women's own voices to reconstruct the inner chambers of a Chinese house where women with bound feet lived and worked. Focusing on the material aspects of footbinding and shoemaking--the tools needed, the procedures, the wealth of symbolism in the shoes, and the amazing regional variations in style--she contends that footbinding was a reasonable course of action for a woman who lived in a Confucian culture that placed the highest moral value on domesticity, motherhood, and handwork. Her absorbing, superbly detailed, and beautifully written book demonstrates that in the women's eyes, footbinding had less to do with the exotic or the sublime than with the mundane business of having to live in a woman's body in a man's world. Footbinding was likely to have started in the tenth century among palace dancers. Ironically, it was meant not to cripple but to enhance their grace. Its meaning shifted dramatically as it became domesticated in the subsequent centuries, though the original hint of sensuality did not entirely disappear. This contradictory image of footbinding as at once degenerate and virtuous, grotesque and refined, is embodied in the key symbol for the practice--the lotus blossom, being both a Buddhist sign of piety and a poetic allusion to sensory pleasures. 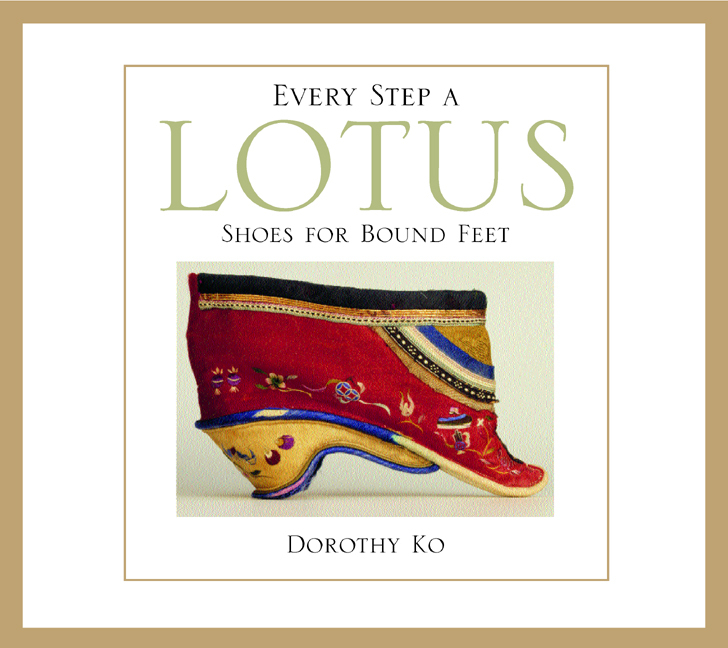 Every Step a Lotus includes almost one hundred illustrations of shoes from different regions of China, material paraphernalia associated with the customs and rituals of footbinding, and historical images that contextualize the narrative. Most of the shoes, from the collection of the Bata Shoe Museum in Toronto, have not been exhibited before. Readers will come away from the book with a richer understanding of why footbinding carries such force as a symbol and why, long after its demise, it continues to exercise a powerful grip on our imaginations. Dorothy Ko is Professor of History at Barnard College, Columbia University. She is the author of Teachers of the Inner Chambers: Women & Culture in Seventeenth-Century China (1994).